Bodh Gaya is the ultimate destination for Buddhists followers and tourists. This is the place where the prince Siddhartha Gautama Buddha attained the supreme Enlightenment. He left his royal dynasty at the age of 29 years. Since then he wandered to various places and meditated for years to find solutions or remedies against the human sufferings and sorrow. Later, at Bodh Gaya, he was blessed with supreme enlightenment that answered his entire quests. People from all walks of life visit the place at least once in their lifetime. Though it is the sacred Buddhist pilgrimage, but people from across the globe visit the place to offer prayers and receive blessings. Bodh Gaya is the most significant place among Kushinagar, Sarnath and Lumbini. 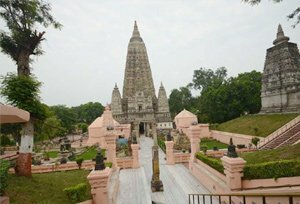 Planning a tour to Bodh Gaya will be a pleasurable experience for anybody. A young boy settled himself under the spreading tree branches and began meditation. He meditated for some days and eventually all the darkness dissolved and he got the solutions to all the human sufferings. Prince Siddhartha Gautama is now the Awakened One, - Buddha, the compassionate and the light of the world that we call now as Buddha the Supreme. After attaining the enlightenment, the Lord Gautama Buddha spent next seven weeks in the village Uruvela. The pipal tree - Ficus religiosa or Bodhi tree is in the Uruvela village which later renowned as Bodh Gaya during the 18th century. This sacred place has many Buddhist monuments, temples and monasteries that reflect the historical and religious relevance of the place. 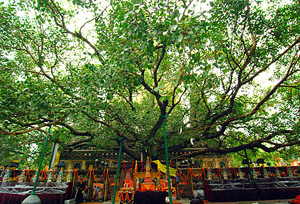 Bodhi Tree: 2500 years ago a young prince was meditating under the pipal tree when he attained the supreme enlightenment. The current tree is the descendant of the original. Devotees circle around the tree and gather fallen tree-leaves and seeds as blessings from the lord. Bodhi Sarovar: It is believed that the Lord Gautama Buddha took bath in the pond before he began his meditation for enlightenment. It is one of the main tourist attractions in Bodh Gaya and travelers from all over the place visit the Bodhi Sarovar to perform various religious ceremonies. Mahabodhi Temple: The temple has the grand structure that rises to 48 square feet, which is 170 ft tall. It is one of the ancient and significant temples of Buddhism. The temple is situated on the east side of the Bodhi tree. Durgeshwari Cave Temples: It is believed that the Lord Buddha meditated for a long time in the caves during his enlightenment period. These caves are located at a distance of 12kms from Bodh Gaya. By Air: Nearest domestic airport is at Gaya. However, many tourists prefer landing at Patna, which is 110kms away from Bodh Gaya. At Patna airport, flights from major cities such as Delhi, Mumbai, Bangalore, Chennai, etc., land on daily basis. By Road: Long drive lovers can hire a luxury private taxi or private bus to reach the holy Buddhist place from Patna. Though, there are connecting roads also available from neighboring states and regions. By Rail: The nearest railway station is at Gaya, just 17kms away from the sacred place. Three-wheelers, taxies and other mode of transportations are available that safely and quickly help tourists reach the destination.